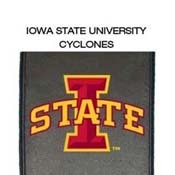 The Iowa State Cyclones Office Chair 2000 is a must for any fan who wants to support the Cyclones both at home or at the office. These office chairs are made from durable high grade synthetic leather upholstery with adjustable arms and a wide width for maximum comfort. Built-in Lumbar Support. Tilt and Lock Control. Best of all the logos zip on and off for endless customization and you can add a second logo to the back of the chair!